The United Nations says it is concerned that drug trafficking is putting the stability of West Africa at risk. The UN anti-drugs chief told the BBC that drugs money could help finance insurgents and lead to further suffering in the region. Antonio Maria Costa made the comments ahead of a series of high-level meetings in Guinea-Bissau. 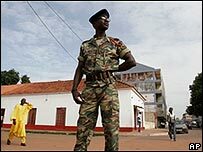 Guinea-Bissau has become a major centre for the trafficking of cocaine from South America to Europe. Cocaine seizures have more than doubled in West Africa in the last five years. This year alone cocaine with a European street-value of $5m has been seized. Mr Costa said the UN Office on Drugs and Crime had raised the alarm two years ago that Africa was being targeted specifically by traffickers exporting cocaine from Latin America. "The problem has become extremely serious; it has grown over the past couple of years exponentially," he told the BBC's Network Africa programme. He said the UN Security Council has decided to look into the matter. "Not as a drug matter but as a threat to the stability of the region," he said. "Let us remember that many countries in the region have emerged from conflict and the situation is still very tense. "We need to avoid the trafficking of narcotics becoming a fuel to roaming bands of insurgents and guerrillas - that could cause a lot of damage to a part of the world that has already suffered so much." Countries in the region were vulnerable to traffickers as there was little air traffic control and no border controls, Mr Costa said. "Our answer of course is development," he said. "The poverty and the condition of post-conflict creates vulnerabilities, but what is missing in this part of the world are jobs, honest governance - this in our view is the foremost instrument to fight such illegal activity."